Tucked away on Rte. 125’s Butcher Boy Plaza, Orzo Cafe/Trattoria is a North Andover jewel. It has the roomy seating area, casual atmosphere, friendly service, open kitchen and moderately priced menu that make it the perfect place for everyone in the family. 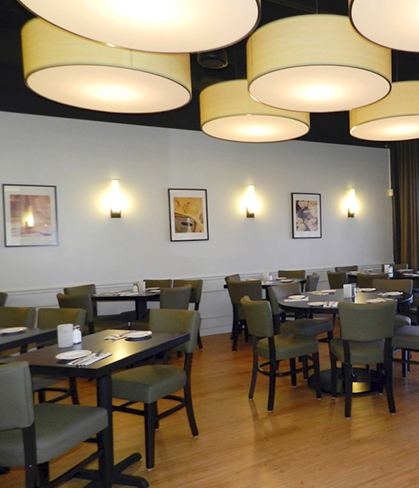 It’s easy to see why Orzo Cafe/Trattoria was voted Greater Andover’s “Best Of The Best” by Market Surveys of America. Diners enjoy starting off with freshly baked bread sticks and a tempting choice of favorite appetizers, salads, and homemade soups. The dinner menu features pasta favorites such as Potato Gnocchi’s, entrees including Chicken Parmigiana and Grill specialties like Steak Pizzaiola. Chef’s specials such as Seared Tuna, Veal & Lobster with Sambuca sauce, and a lobster and pasta special every Friday add to the extensive choices. Orzo’s fresh fish arrives daily and is always a house favorite.Luncheon customers can choose from an assortment of pannino sandwiches, pizza and calzone, along with Orzo’s pastas and entrees. For the younger guests, Orzo has a children’s menu featuring all time favorites such as ziti with meatballs and pizza. Orzo features a full service bar and a wine list with enough choices to please everyone’s palette. Orzo even has an “impossible to say no” dessert menu complete with espresso, cappuccino and, or course, coffee. Along with Italian Family style dining Orzo offers private parties, offsite catering and a full takeout menu. They accept Mastercard, Visa, and American Express and gift certificates are the perfect gift for any occasion. You can visit Orzo at 1085 Osgood Street, North Andover.